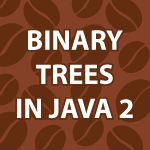 Welcome to my 2nd video on Binary Trees in Java. If you haven’t seen part 1, definitely watch it first or this will be confusing binary tree in Java. In this part of the tutorial, I will take you step-by-step through the process of deleting nodes in a binary tree. This topic seems to be confusing to many people. I personally prefer to build trees with the builder design pattern like I showed here Encapsulate Composite with Builder, but it is also important to understand the basics of the binary tree. I really enjoy your tutorials. They are the best that I have ever seen. Thank you very much for making those videos, which are super helpful! I wonder in the near future if you plan to do some tutorials on java generics. (As focusNode.leftChild is null )? Line 274 (As focusNode.leftChild is null ).. The question I have is related to your code but not really related to the BinaryTree topic. I run your code on Eclipse and get error of “coudn’t find the main class, program exit”. It happened to several classes of mine recently and I don’t know why. Can you help me with this? Check out Install Eclipse for Java. You need to save the code in the source folder in the project explorer. Thank you so much for your wonderful tutorial! I have a favor to ask about tutorial about a B-Tree or B+Tree? If you can help me about it. You’re very welcome 🙂 Thank you. Yes I will make an advanced algorithm tutorial very soon. Your tutorials are excellent, explanatory and free..I am the #1 fan of your presentation style! As I’m java beginner I face with a lot of questions, would you mind give me your email. Thank you for your quick reply, you’re awesome! I have completed all your java video and java algorithms tutorials but i don’t know which one should i study next. Can you write me which order i have to follow, i have planned to finish all your video tutorials. I am addicted to your tutorials! Thank you 🙂 They were made to watch in this order : Design Patterns, UML, Object Oriented Design, Refactoring, but you can do them in any order for the most part. Excellent tutorial! However, I noticed that in your delete function you don’t check for a null root before entering the while loop. This can lead to an infinite loop if the user tries to delete any node while the list is empty. in-between lines 171 and 175. Thanks for the input. Sorry I missed that. i was writing out of my head.